My daughter loves butterflies. 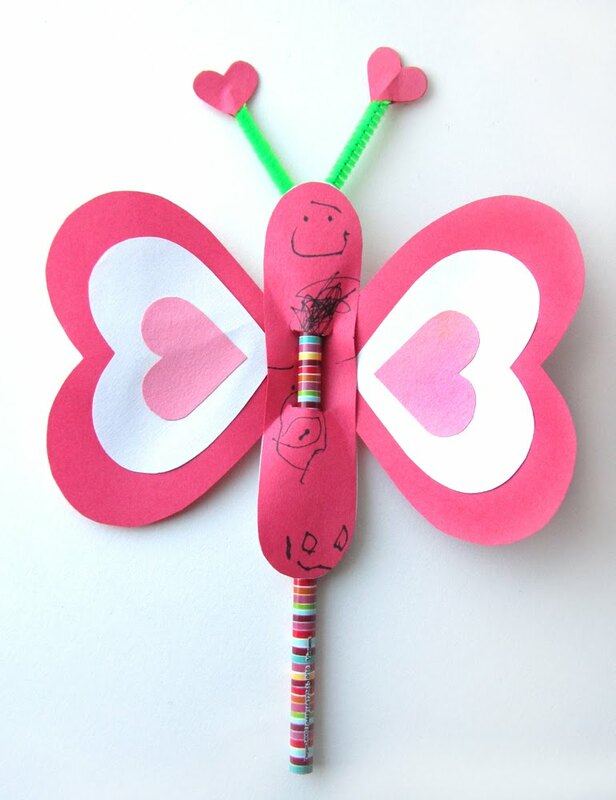 So when it came time to plan Valentines to make for her preschool class, butterflies seemed like the perfect choice. Using simple materials, you can easily make this adorable butterfly Valentine. Depending on the age and ability (and patience!) of your child, you may want to cut out the pieces ahead of time. My daughter was delighted to just do the drawing and gluing. 1. Click here to download the butterfly template. Print onto cardstock and cut out. 2. 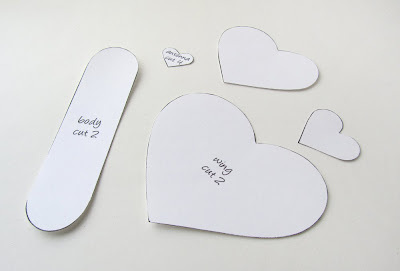 Trace butterfly body and hearts onto construction paper in the color of your choice, and cut out pieces. For each butterfly, cut 2 body pieces and 2 wings, and any smaller hearts you want to use to decorate the wings. If you want to put hearts on the ends of the antennas, cut out 4 of the smallest hearts. 3. Decorate the wings and body. Glue the smaller hearts on top of the larger hearts for a layered effect on the wings. Alternately, you could use crayons or paint to decorate the wings. Draw a face on one of the butterfly body pieces. Or if your child is like mine, they will draw a forehead, face, hair, arms, feet, and a belly button; some may even have their hands in their pockets, and others may have a mouthful of blueberries! 4. Assemble the butterfly. Glue the wings to the back body piece as shown. Glue the front body piece (with the face) directly on top of the back piece so that the wings are sandwiched in between. If you want to write a message on the butterfly, now is a good time to do that. We went with "You make my heart flutter" and "Sending you butterfly kisses". 5. Make the antennas. 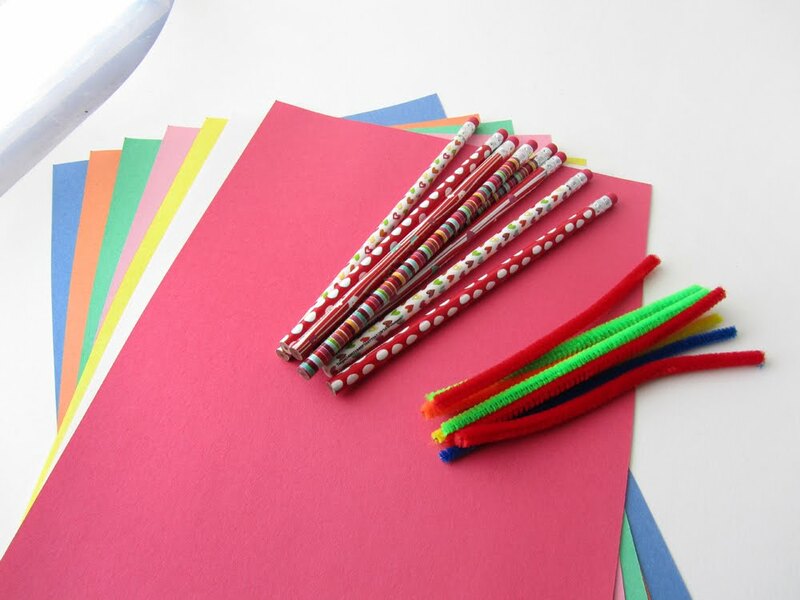 Take one length of pipe cleaner and twist it around the top of the pencil, just under the eraser, then bend the ends so they are pointing up. Take 2 of your smallest hearts and glue them together, sandwiching one of the pipe cleaner antenna tips in between; repeat for the other antenna. Alternately, you can just curl the ends of the pipe cleaners. 6. Add the pencil to the butterfly. Cut two approximately 1/2" slits about 1" apart in the center of the butterfly body, and insert the pencil through with the eraser at the top as shown. For some reason the template is not working, do you still have it? Can you email it to me? It should still be working...to get the template, you need to go to the downloads page (http://www.mhcmag.com/p/downloads.html) then scroll down to the Butterfly Valentine Template. Click on the picture to bring up the full size image, then right click and select "save image as". Be sure to note where you save it so that you can find it to open and print. :) I will go ahead and email it to you as well.